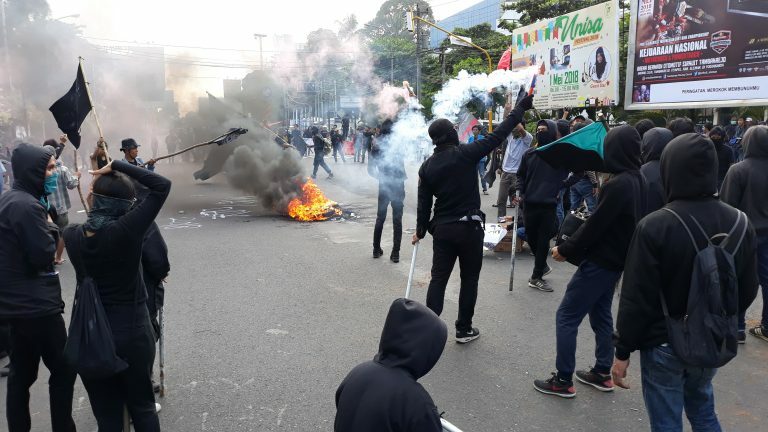 Indonesia: Statement from anti-fascist front Inveigh about police violence against Mayday in Yogyakarta. Originally published by Subversion 1312 Facebook page. Images and videos from AGITASI. To be reminded of all above the fulfillment, the anti-fascist group angered about their repression within violence against the people. Demonstration is the face where the true expression became true action of democracy, but they stole it, and do violence against the protesters. That was the expression of the government and the civilian wasn’t to be side with people, that was product where’s they’re traitor against the people voice. Within burning the 2*2 meter police station was the expression of anger of them because the vgovernment don’t want to hear and act for their aspirations. The violence is the true face of the government, not only in Indonesia but there’s more examples from another country around the world. They do it as a tool that wrapped in the name of stabilization and secure the civilization. they do that to stole the land, make an condemnation of people land, and take down the movement of people. That was the face of the fascism today, they just reform and wrapped to make the people feel safe and love their nationality. Solidarity with Anarchists in #Yogyakarta, so-called Indonesia from #Narrm / #Melbourne (so-called Australia) Anarchists – Enough is Enough! #Yogyakarta, #Indonesia: Open Letter from Anarchist Prisoner Ucil / Brian Valentino – Enough is Enough!